This collection is a tribute to copper. My admiration for this pure mineral began with the discovery of Edgar Degas’ bronze sculptures in France. Beyond its use in Art, copper played a significant role in the development of many civilizations. It has been used by Human as early as the 5th century BC, mined very early in the Balkans and already fused in Serbia in 5500 BC. Nowadays, it still remains at the heart of economic stakes worldwide. It is also key for infrastructure and design of products which generate renewable energy, such as windturbines. Indeed, it is the best thermal and electrical conductor among the metals used for that purpose. Copper is further a fascinating metal, symbol of youth and love, represented by the emblem of the planet and goddess Venus. It is also a wonderful material to work with. 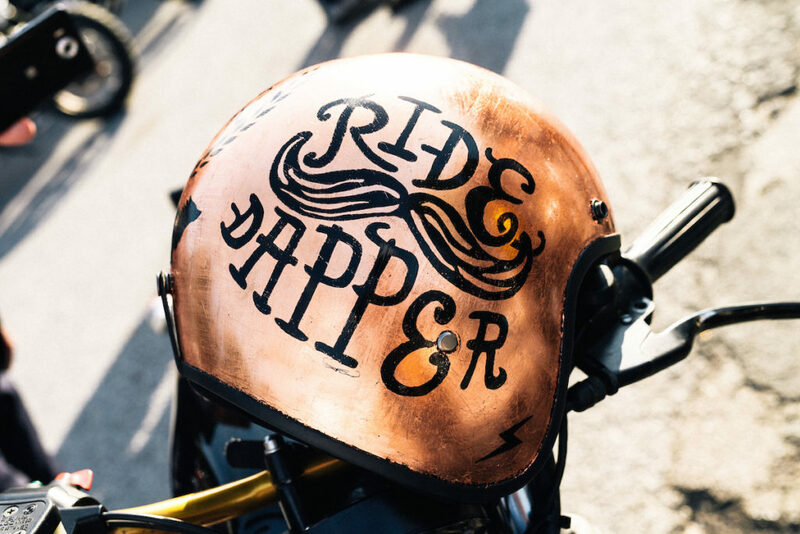 In the “Copper” Collection, I customized helmets with the application of copper leaves. No two leaves are alike, making each time unique helmets. The difficulty resides in handling the fragile material and harmoniously compose helmets with a matching number of leaves. They fly and escape your fingers as soon as you breathe too deeply, tear each others with a simple gesture…but always match perfectly the curved shapes of a creation. 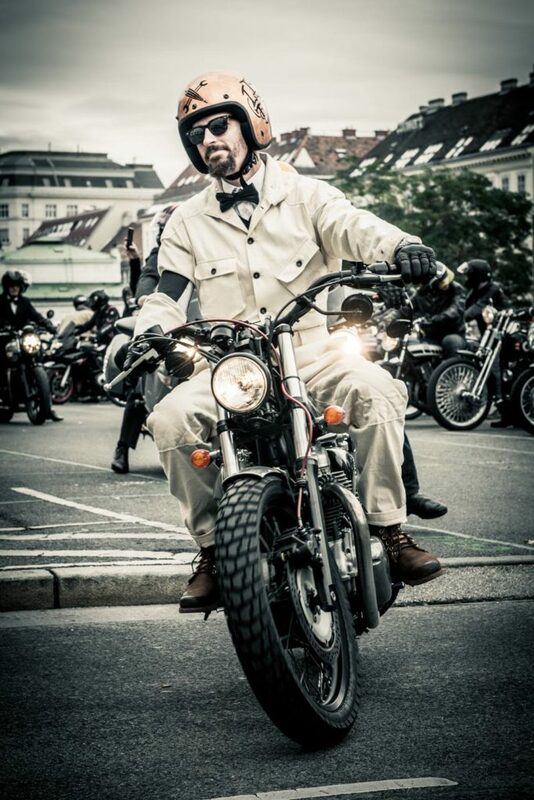 The helmet shown below has been created for the occasion of the Distinguished Gentleman’s ride (DGR) in 2016 in Vienna, Austria. 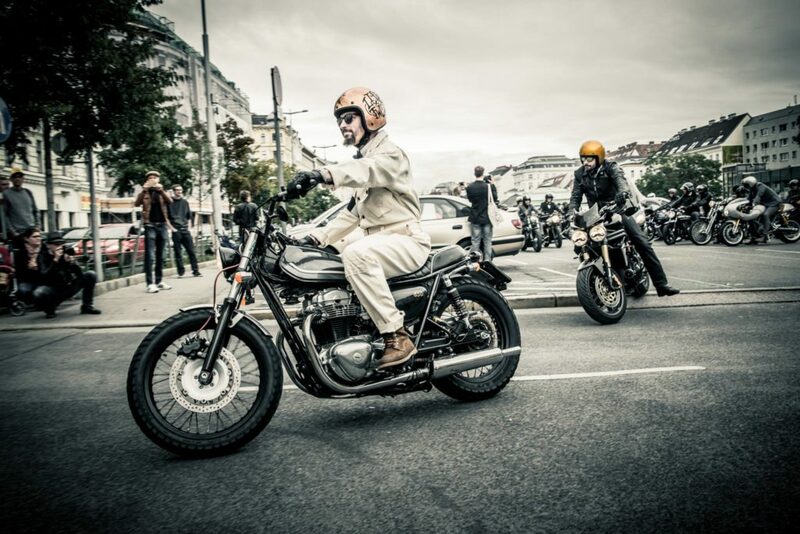 It is a ride bringing together riders in more than hundreds of cities worldwide. 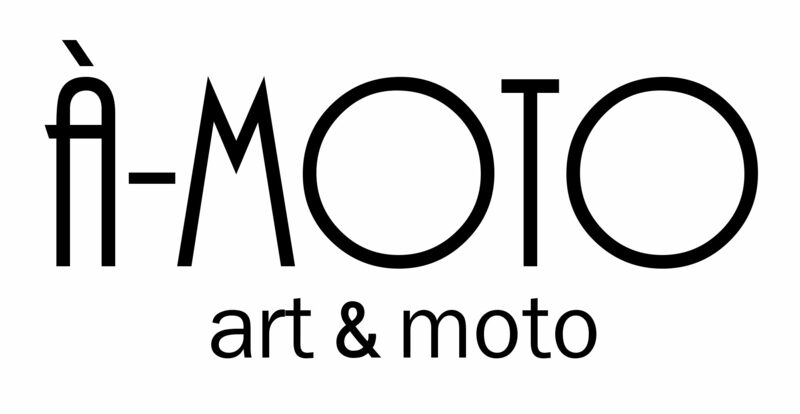 Moto riders wear their finest suit on their finest classic (or not) motorcycles, with the aim to raise funds and awareness for men’s health. On the helmet, I scratched the DGR logos weon applied copper leaves on the front (an umbrella and a tool) and on the back (initials). 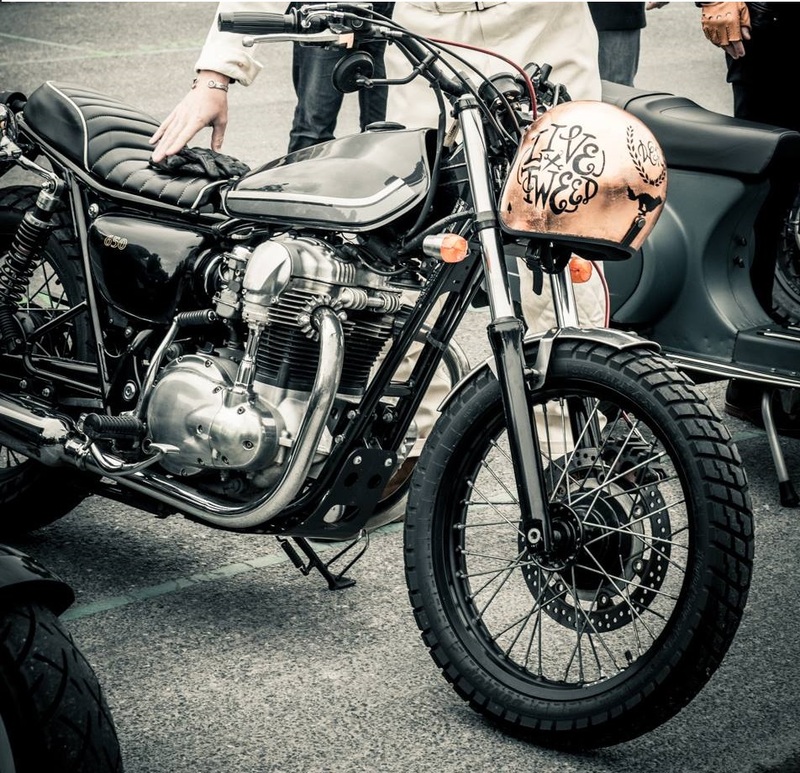 I then etched the slogans “Ride dapper” and “Live tweed” on the right and left sides. The wolf painted on the back was added as a nod to his owner’s name: Wolfgang. 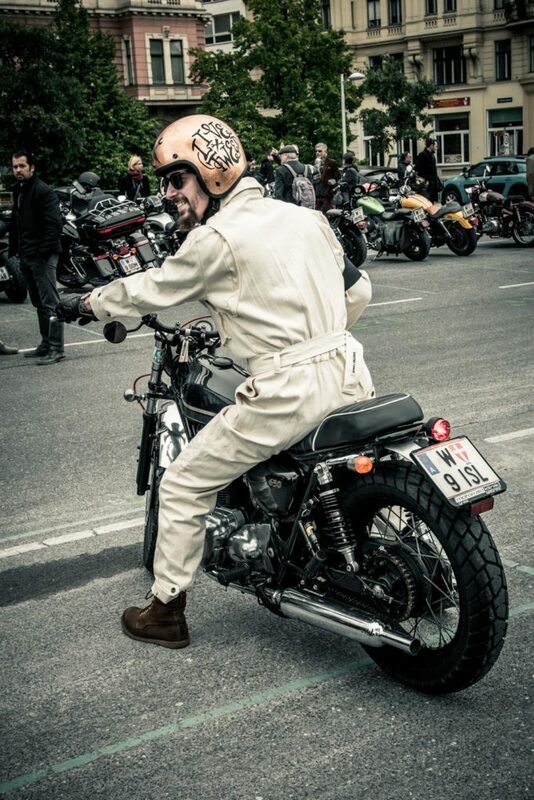 The DGR Helmet and its owner, Wolfgang, riding a beautiful Kawasaki W650 at the Distinguished Gentleman’s Ride in Vienna, Austria.